Security double glazed “two door entrance”, neutral painted and coved ceiling, smooth plastered walls all in neutral colours, ceiling light point, various power points, part carpet and part Karndean flooring, radiator, stairs to first floor, under stairs storage cupboard. Double glazed sliding patio doors leading to Conservatory / Family Room, double opening glazed doors to the Main Dining Room, neutral coloured plastered ceiling and walls, two ceiling light points, feature wall mounted Modern Fireplace, wall mounted television point, radiator, various power points, Karndean Flooring. Double glazed patio doors lead to rear garden, sloped polycarbonate ceiling with decorative fabric covering, exposed brick walls and tiled flooring, radiator, various power points. Double glazed bay window to front, part glazed doors from lounge and open to the Hallway, plastered and coved ceiling, smooth plastered walls all painted in neutral colours with feature decorative paper to one wall, ceiling light point, various power points, Karndean flooring, radiator. Dual aspect double glazed window front and side, neutral painted and coved ceiling, smooth plastered walls all painted in neutral colours, ceiling light point. Range of fitted High Gloss units at both base and eye level. Roll top work surface with tiled splashback, space for Range Cooker with extractor fan above, stainless steel single drainer with mixer tap, space for dishwasher and American Style Fridge Freezer, tiled flooring, various power points. Double glazed window to side, plastered ceiling and walls in neutral colours, range of both base and eye level, roll top work surface with space and plumbing for several domestic appliances, single drainer stainless steel sink unit and mixer tap, low level WC, radiator, tiled flooring. Plastered ceiling and walls, ceiling light point, carpeted, access to loft. 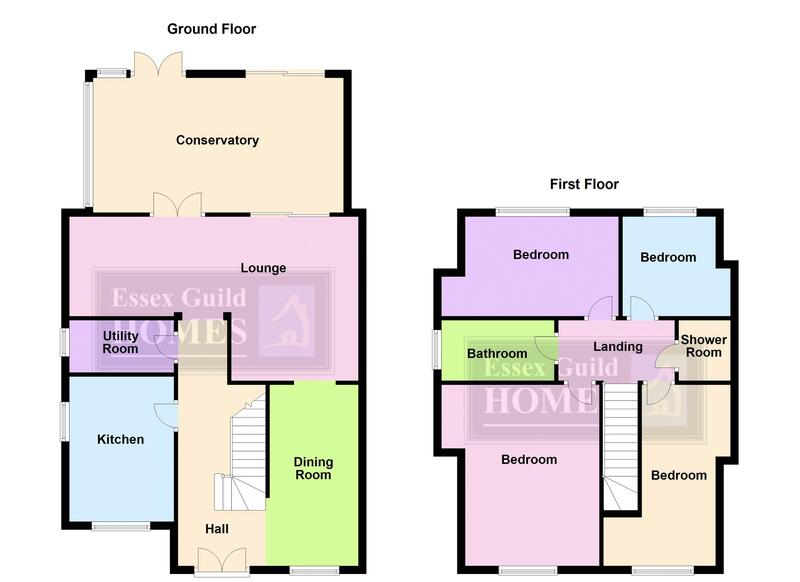 White double glazed window to front, plastered and coved ceiling, smooth plastered walls all painted in neutral colours, television aerial point, radiator, neutral coloured carpet, easy access to Bedroom Four (Potential Dressing Room) see floor plans. White double glazed window to rear, plastered and coved ceiling, smooth plastered walls all painted in neutral colours, ceiling light point, wall mounted television aerial point, radiator, neutral coloured carpet, radiator, built-in cupboard. White double glazed window to front, plastered and coved ceiling, smooth plastered walls all painted in neutral colours with feature paper to one wall, ceiling light point, wall mounted television aerial point, radiator, neutral coloured carpet, radiator, eaves cupboard. White double glazed window to rear, plastered and coved ceiling, smooth plastered walls all painted in neutral colours with feature paper to one wall, ceiling light point, radiator, neutral coloured carpet, radiator. White double glazed window to side, fully tiled walls, three piece suite comprises panelled bath with mixer tap and shower attachment, low level WC, wash hand basin with cabinet below, radiator, tiled flooring. Plastered ceiling and tiled walls, space to easily install a sink, tiled shower cubicle with opaque sliding door and inset shower. Commences with large patio area extending to the width of the property, then mostly laid to lawn, decked patio to rear with shed, panelled fencing to sides, gate provides access to front. Situated in the Rear Garden with access down the side of the property, up and over door to front, power and lighting, windows to side. New block paved driveway allowing multi vehicular parking, this extends down the side of the property and leads to the Detached Garage.